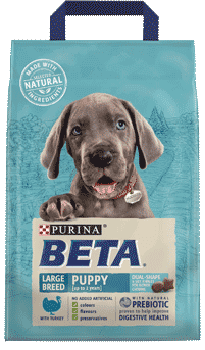 Beta Large Breed Puppy Food is manufactured by Purina, a well-known company in the pet food industry. This specific food is meant for puppies that are under 24 months old. The manufacturer has enriched it with lots of nutrients to aid in the growth and development of your young pet. This food is not meant for a particular breed of dog. However, the portions fed to your dog will be determined by the breed or the expected adult weight of your pet. This article will cover every important aspect of this food. This includes the ingredients, nutritional value, and feeding guidelines. Beta Large powered by Purina employs natural ingredients only for the care of your puppy. About 14 percent of the meal is made up of meat and animal derivatives. Dogs are naturally evolved to eat meat. This is why the manufacturer had to include this ingredient. Proteins are important for the growth of bones and muscles in your young pet. On the other hand, cereals and whole grains take up 48 percent of this food’s content. High-quality cereals are important to dogs since they provide them with energy. This is essential for active dogs. That being said, you need to make sure you stick to the recommended portions. Your dog may gain weight and risk other lifestyle diseases if you indulge them too many treats. The main recipe is also packed with vegetable protein extracts, oils, and fats, vegetables, and minerals. On top of that, the manufacturer included chicory roots. These help promote the growth of bacteria in the dog’s gut and also improve the flavor of the food in general. Antioxidants are the only additives in this food. Therefore, the recipe does not contain artificial colors flavors, or preservatives as these can be harmful to your dog. DHA is a quality form of Omega-3 Fatty Acids. This helps in the growth of the brain and nervous systems of dogs. It also helps to improve the vision of these pets. In addition to the listed nutrients, this dog food contains chicory roots which are rich in inulin. This is a probiotic that aids with the growth of healthy bacteria in the dog’s gut. Chicory roots are included in very low proportions as dogs don’t need much of it. Also, high amounts of inulin can cause digestive problems to your pet, just the same way excessive fiber will negatively affect the dog’s digestive system. The food is also enriched with vitamins and minerals that help in the growth of bones and teeth in your dog. Antioxidants are included as additives in this meal. 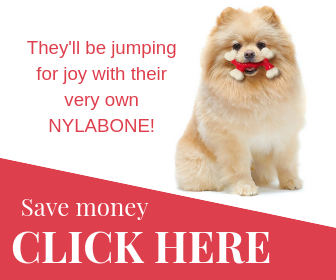 They support the healthy growth of your dog’s immune system. Overall, this is a highly nutritious meal that also provides balance in your puppy's diet. Purina made sure this product addresses all strong and weak points of a large breed puppy. This meal should be introduced to your dog gradually over a period of 7 days. If you are feeding an adult dog, you should split the portions into two meals. Puppies need three or more separate meals every day. In addition to the food, you should make sure water is available to your dog at all times. This is only meant as a guide to feeding your dog. In reality, you need to consider more than just the dog’s age. The weather, weight, activity levels, health, and physical state of your dog also need to be considered. This food is meant for dogs under the age of 2 years. The best care you can provide to your furry family member is to take them to the vet. Before reading the feeding guide, you will have first to find out the expected adult weight of your dog. This is another crucial factor in determining how much of this meal you should feed the pet. If possible, you should see a vet for advice on the exact quantity to feed your dog. Be sure to inform them of any treats you give to him regularly. Around 1.5 months- 115 grams. 3 to 5 months- 235 to 335 grams. 5 to 8 months- 335 to 520 grams. 8 to 12 months- 520 to 560 grams. 12 to 24 months- 560 to 630 grams. Going beyond the right amounts of food will either cause nutritional deficiency or obesity. Both of these scenarios will have serious health consequences. It is made of natural ingredients only. These have been noted to be more nutritious than processed foods. It contains chicory roots, a rarity in this market. These provide food to the healthy bacteria in dogs’ guts. The meal is rich in all the nutrients a dog needs. It contains DHA, a high-quality form of Omega-3 Fatty Acids. This is important for the growth of the dog’s brain, nervous system, and vision. The food does not contain any artificial flavors, preservatives or even colors. Beta Large Breed Puppy Food is one of the best dog foods you can get for puppies. It is made with dual shape and size kibbles for easier chewing. Puppies under 24 months enjoy the taste of this food partly thanks to its chicory roots. In addition, this recipe is made to help the natural growth of your puppy. It has high proportions of healthy Omega-3 Fatty Acids that help with the brain development of the dog. The nervous system and the vision of the puppy will also develop well due to this nutrient. Since your young puppy needs to play, the manufacturer also included high amounts of healthy cereals that can easily be digested by puppies for healthy bursts of energy. If you have a young dog at home, you should buy this food for them and watch them grow to be healthy, strong, and happy family members.